Do you love wearing bold pieces that turn heads? Are you drawn to everything sparkly, shiny, and glittery? 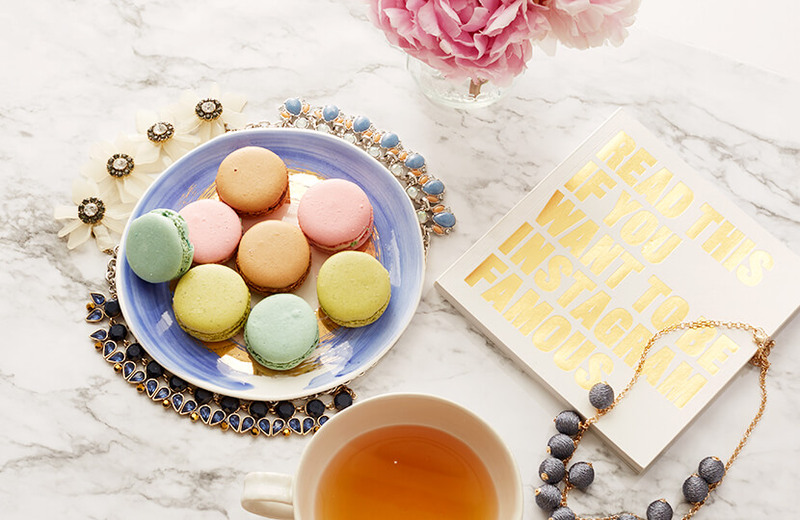 We dive into the details of glam style and share tips for dressing in this wow-worthy style! Finally, women sizes 14 and above can define their style with words that aren’t limited to simply to the phrase “plus size.” Plus size is a size category and does not speak to the array of individual style preferences that our diverse plus community enjoys. Because for so long plus size clothing options have been limited, we haven’t had too many chances to walk into unique boutiques and find the styles that speak to us. So we’re breaking down some unique style profiles in our “What’s My Style” series to help you discover how to best define your personal style. Today, we’re taking on glam style! Glam is, of course, short for glamorous. Think fur coats, statement jewelry, and girly heels. While there are several ways to be glam, generally the style tends to be more on the feminine side. But don’t feel like you have to limit yourself to being just one thing—you can certainly be “boho glam,” or “retro glam” or something in-between. While casual style is best defined as fuss-free comfort, glam is defined as extra and fancy. Think of a spectrum with extremely casual being on one end and extremely glam on the opposite, and most people falling somewhere in between. We all have a casual outfit every now and then, but those of us who are glam, our “casual” outfit might just feature metallic sneakers and a bold lip. Does this sound like it might be you? Then it might be time to update your style profile to glam. Here’s an example of a Dia Style Box featuring glam pieces. You’d feel naked if your outfit included just one piece of jewelry. You feel unstoppable in a (faux) fur coat. Makeup is super important to you, and you wear it most days. You rock a bold lip or a smokey eye to complete your outfits. Flats are at a minimum in your closet—but the few you do have are embellished. Your nails are always freshly done, and you play with bold and flashy polishes. Sneakers are your thing, and sometimes flats, but rarely do you wear heels. Pieces that require special undergarments, like strapless bras, sit in your closet without ever getting worn. You rarely wear dresses or skirts, you wear pants almost all the time. You like to stick to a few special pieces of jewelry. You don’t like to play with fashion or costume jewelry. You like to fly under-the-radar and don’t like your clothing to draw too much attention to you. Your nails are generally polish-free and you prefer it that way. Read on to see some of our favorite glam outfits to help you further define your style! The best dress is a dress that makes dancing a blast. Bring a neutral-colored dress to life with wow-worthy accessories. 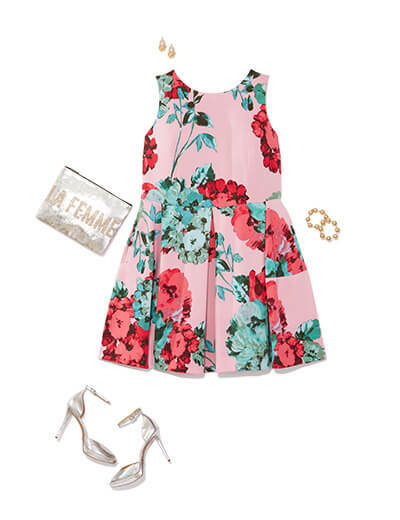 Floral meets fabulous when you add metallic accessories to a flowery dress. You’ll bloom and sparkle wherever you are planted. A shirt with a cutout detail is always sure to catch eyes. Highlight your shoulders with dangly earrings and an updo. Distressed jeans go from edgy to glam when embellished with rhinestones. 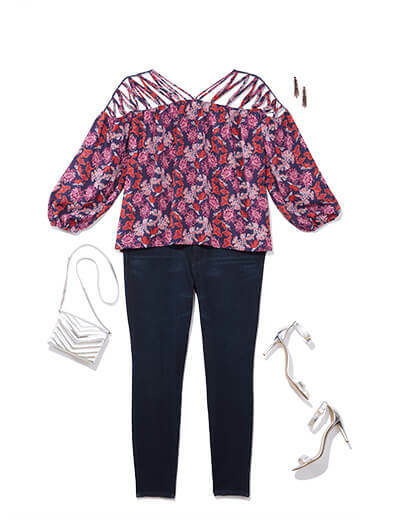 A top in a bold hue will surely turn heads. A floral jumpsuit is nighttime appropriate when paired with glam accessories. Bring out the bold hues of the jumpsuit with red heels and fun earrings. Add some glam to a solid black jumpsuit with an embellished belt and accessories. Chandelier earrings make this look ballroom-ready. A faux fur statement jacket adds pizzazz to a denim-sweater combo while sparkly socks and a neckerchief give this look an unexpected fashion-forward feel. Preppy stripes get a glam update with a head-turning metallic bomber jacket. Edgy booties and a glam velvet handbag adds to the drama. A beaded swing dress is reminiscent of the Roaring 20’s glamour. Add a faux fur bolero for a luxurious touch of texture. What’s more glamorous than a velvet dress? 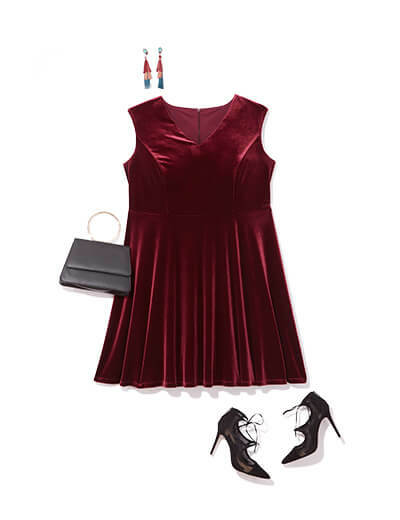 Bold dangly earrings and playful pumps are the perfect co-stars to a velvet ensemble. Do you want to see any of the above outfits in your next Dia Box? Be sure to update your preferences to reflect your newly-defined style. Make sure that you share your gorgeous new outfits on Instagram with hashtag #MyDiaStyle so we can see and share!